Learn how to export EVTO waypoints to your in-car navigation system. In this tutorial we are going to describe how to create a series of waypoints in a trip and then export these waypoints to the car to be used by the cars navigation system. We will be using your mobile devices calendar feature along with Tesla’s Mobile Application as intermediaries between EVTO and the cars navigation system. Essentially we are going to “enhance” the cars navigation system with routable waypoints. To have fun and to hopefully give you some extra value, we are going to be taking a trip from San Francisco to California’s famous Napa Valley wine country. We have assembled a full day of wine tasting, lunch and dinner at a number of our favorite Napa Valley haunts. Many of these are not on the “usual suspects” list and are brought to us by locals who really know the area and what is unique there. Have fun with the tutorial and we hope you can also take advantage of the itinerary someday too. Note: You should not drink and drive. The proper way to taste wine is to actually not swallow the sampled wine but to discard it and to cleanse your palate with a small bit of food such as cheese, crackers or sorbet. Each winery will provide you with their recommended technique. Note: Some of the wineries in this tutorial require reservations. Touch the winery link to determine if this is required before you visit that location. 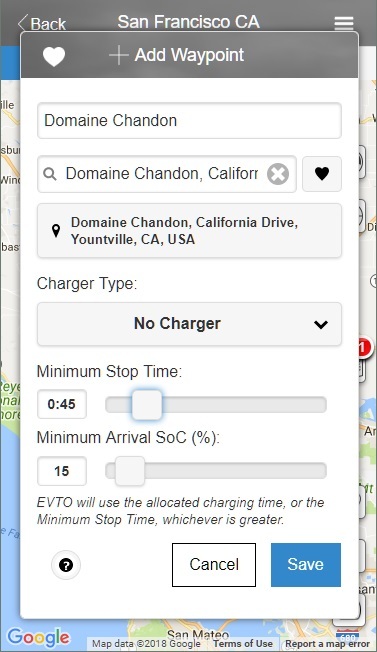 This is even more of a reason to use EVTO to manage your trip schedule. Note: This tutorial requires an EVTO subscription in order to complete all of the tasks. Creating a simple out and back trip. Adding a series of waypoints for the days stops. Setting the routing to match our visit order. Adding the trips waypoints to your mobile devices calendar as events. Integrating your devices calendar with the car. Navigating to the first stop. For this tutorial we will be using EVTO in manual mode. 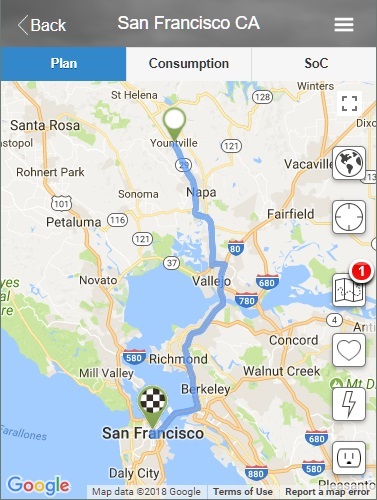 Our purpose is to create an itinerary of waypoints that can be imported into the Tesla navigation system as a routable location. EVTO will determine the ideal order of stops, insure that we have sufficient energy to complete the trip, manage our time at each location and provide routable locations for the car. Our trip will be a single day starting and ending in San Francisco. We will drive to the famous Napa Valley for a full day of wine tasting in the valley along with two notable stops for lunch and dinner. We will conclude our day by arriving back in San Francisco around 8PM. 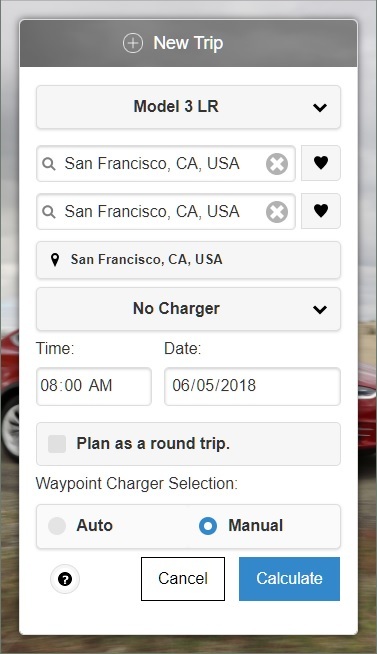 For this trip we will be using a Long Range Tesla Model 3 but any Tesla should be able to make the trip without charging if you start on a reasonably full battery. For this trip we are going to create a single day trip that originates and terminates in the same location. When we create the the trip we will essentially go nowhere. It will only be after adding one or more waypoints that will we have a true trip. In the second input box from the top (destination) type: san fr. Choose San Francisco, CA, USA from the list. Select Manual from the Waypoint Charger Selection choice. Map with colocated origin and destination. 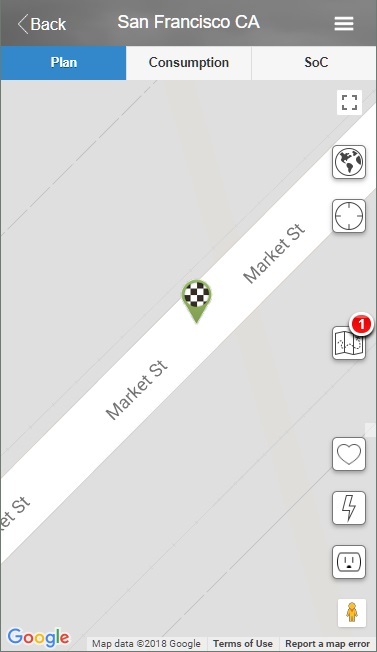 After a few moments the map will reset and zoom into Market Street in San Francisco. Our trip begins and ends at the same place so the map is zoomed in all of the way. 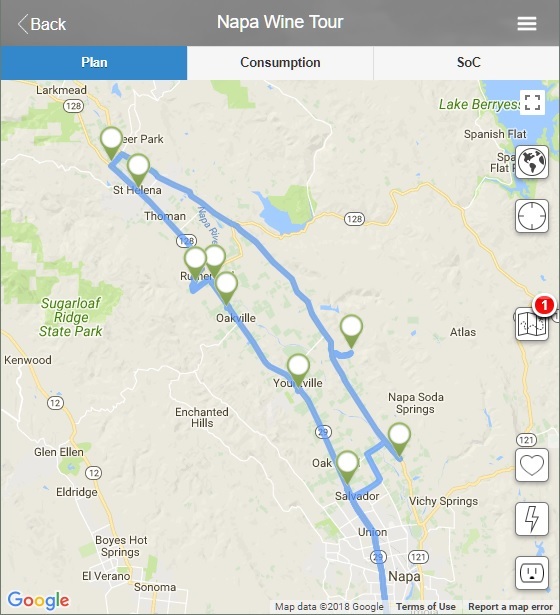 We will fix this in the next step by adding our Napa Valley waypoints. Now we need to add all of our days stops as waypoints. We will be visiting seven wineries, staying 45 minutes at each location. We will take a lunch break in St. Helena near the top of the Napa Valley and then move down the eastern side visiting the remaining wineries in our itinerary before stopping for an early dinner in Napa, and then return to San Francisco by around 8pm. It will be a full day, but an exciting one if you love wines, good food and driving your Tesla. Lets add our first stop. Once you complete this step you will continue doing the exact same process for the remaining stops. Our first winery is Domaine Chandon in Yountville. In the Enter Location input type: domaine chandon and select: Domaine Chandon, California Dr, Yountville, CA 94599. Minimum Stop Time: drag the slider to 0:45. We will spend 45 minutes at each winery. Our trip with the first stop added. Now to see that we do indeed have a trip that goes somewhere, select the little globe icon on the maps upper right side. 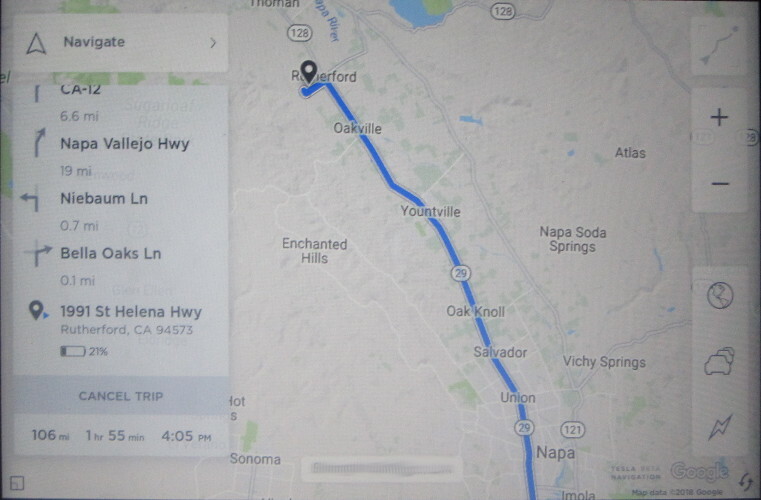 This will zoom the map out to show the full extent of our trip: An origin in San Francisco, and a stop (green pushpin icon) in Yountville. The destination icon covers over the origin icon so it looks like this is a one way trip, but it’s not. 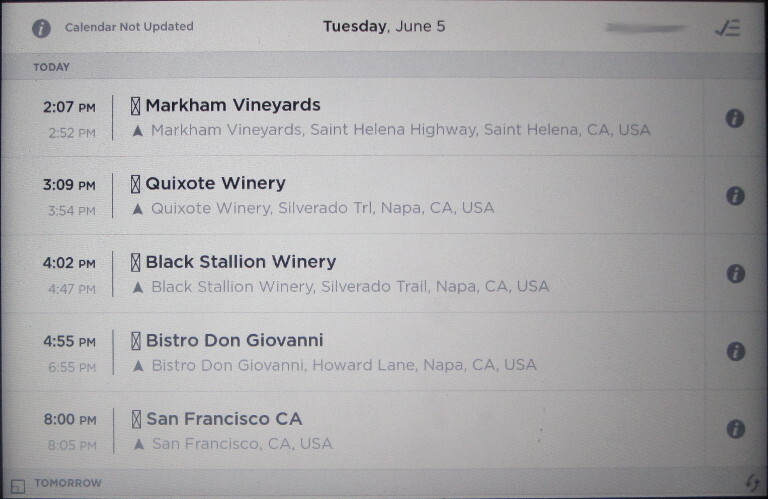 You will now repeat these steps adding our other wineries as waypoints in exactly the same way. Use the following list by entering the first few characters in the wineries name until you see the address in the list and then select it. Don’t forget to slide the Minimum Stop Time to 0:45 for each stop. Our trip with all of our stops recorded. Now we will use the Add Waypoint feature to include our two meal stops too. Don’t worry about the sequence. EVTO and the routing server will figure that out in a moment. When you add Market extend it’s minimum stop time to 1:30 and Bistro Don Giovanni’s to 2:00. We don’t want to rush ourselves at these great restaurants and we have plenty of time for everything and still get you back to San Francisco by early evening. The Segment Browser showing our completed trip. As you were adding waypoints EVTO was rapidly integrating them into the trip. The routing server was figuring out the distances and routing and EVTO was doing energy calculations to determine your state of charge at each stop along with any related influences like weather. Unfortunately much of this work now needs to be corrected. Why? Because the routing server did not understand the “order” we wanted to visit these stops. It created the most expedient trip to minimize travel time. The trip it plotted was actually backwards from what we want. The good news is that EVTO has a feature to quickly correct this. Go the the Plan menu and select the Reverse Waypoint Order menu item. Confirm the reverse route when prompted. Now the stops are in the order we want them to be. You will notice the Segment Browser has a new button added to the bottom, Restore Auto Waypoint Order. This button would restore the optimal order the routing server first put in place. Note: Those arrow buttons next to the waypoint names allow you to manually resequence the trips waypoints in any order you want. Mobile devices calendar showing EVTO waypoints. Select the Add to Calendar menu item. Confirm the dialog that pops up. Your waypoints along with your expected arrival times and the duration of each stop is now added to your devices calendar. Note: If you make any changes in EVTO to this trip that update the times or durations you should repeat this step. The old calendar entries will immediately be replaced with the new ones. In fact if you do this during your trip the cars calendar will also be updated immediately too. Calendar events from mobile device shown in car. 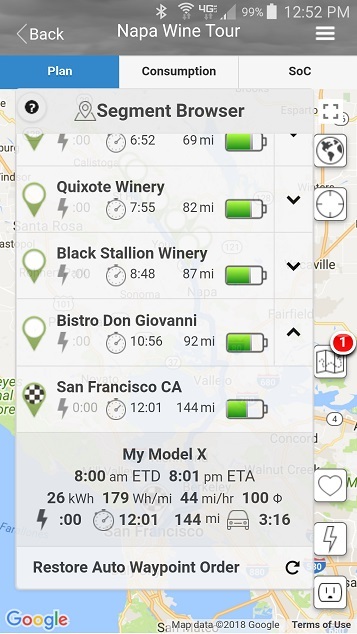 One of the features of the Tesla Mobile Application is the ability to show your mobile devices calendar events on the cars center console and if the events include location information, navigate to those locations. Open the Tesla Mobile Application on your mobile device. In the Tesla Mobile App select the gear icon and toggle on the Calendar Sync switch. Ensure your device is connected to the car via Bluetooth. Select the calendar icon in the Tesla center console. Your calendar events should appear. Note: For iOS users check on the iPhone under General>Restrictions>Privacy>Calendar the setting must be “allow changes”. Navigating to a calendar event location. 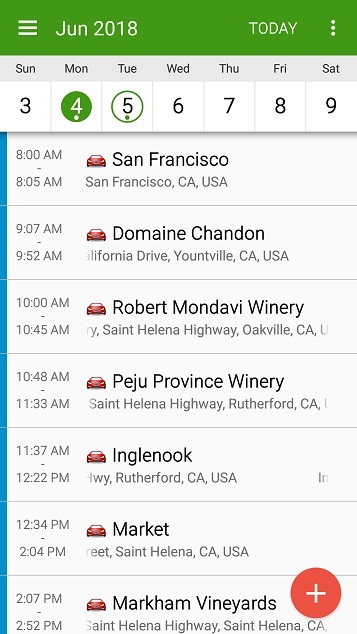 Once the calendar events are loaded and you can see them in the cars Calendar app, it is very easy to navigate to each location. Simply select the calendar entry on the cars center console and the navigation system will immediately calculate the route to the location from your current location. We had so many great ideas for places to do wine tasting and eat, we had to pick ones that best helped us articulate the concepts of the tutorial. We thought we would share these other locations with you should you consider a trip to the area. Each of these spots are as good as the ones we featured and deserve your attention too. We have shown you how to create a simple out and back trip returning the same day to your starting location. We have also demonstrated how you can manually add waypoints, quickly reverse the order of travel, add the waypoints to your calendar and how to navigate directly to these events using the in car navigation system. In addition we have provided you an exciting opportunity to visit on of the world’s leading wine destinations and have provided you an insiders list of places to wine taste and enjoy two sumptuous meals. Enter the Trip ID of gtj4hvmtf8dp0f7jih2ls and the PIN as 1234.